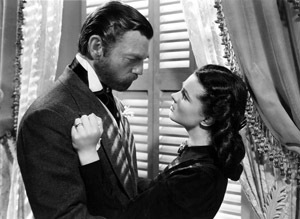 Image taken from a screening of "Gone With The Wind". Special Containment Procedures: The roadway leading to SCP-1781 has been blocked off near State Road ██. A perimeter fence has been constructed around SCP-1781, and is to be patrolled nightly. Any individuals who breach the fence are to be contained, administered a Class A amnestic, and turned over to the ███████████ Police Department. Description: SCP-1781 is a drive-in movie theater located south of ███████████, Indiana, along State Road ██. The theater consists of a dirt parking lot, a concrete projector booth, a large screen, and a sign near the entrance labeled "Moonlight Theater". During daylight hours, SCP-1781 exhibits no anomalous properties. The projector booth can be entered, and contains a standard movie projector1 used in similar theaters. Every other night at dusk, SCP-1781 will activate. The door to the projector booth will close if it is open and the parking lot lights will dim if they are lit. The projector within the booth will then begin playing a random film. Thus far, there appears to be no restrictions on the genre or length of film shown. During this time, the projector booth door and window cannot be opened. The selected film will run for its duration, and upon ending SCP-1781 will deactivate, causing previously dimmed lights to return to full luminescence and the projector booth to become accessible once again. Individuals within the projection booth when SCP-1781 activates seem to experience no passage of time during the film. While the type of film shown can vary wildly, the single constant throughout all observed showings is the presence of Australian/British film actor Hugo Weaving in some role previously filled by another actor, actress, or prop. Often these inclusions are immediately recognizable, while in others the role may be very small2. Notably, it has been verified that none of the films shown have ever cast Hugo Weaving in the roles he assumes during screenings of SCP-1781. Additionally, when he replaces a major character, or his presence is otherwise obvious, no characters in the film will take notice of him, regardless of the capacity he is in. His inclusion may, however, cause discrepancies in the film from the original version. I don't know what it is, and I don't care. I ran the numbers, and we get at least a 15% attendance boost whenever we show movies with this guy in it. Not only that, popcorn sales increase, on average, 22%! We've got to find a way to get him in every single goddamn film, I swear. Somebody needs to call one of those film students in Hollywood and get them on this. Aldon got your letter. We can definitely work with that. Can't wait to get started. You'll know when we're done. Observation Logs: The following are records of observed screenings of SCP-1781. Personnel assigned to SCP-1781 are reminded to list the date, film title, role taken by Hugo Weaving, and any variations from the original production, if applicable. Role Taken: God, previously assumed by Morgan Freeman. Variations: No major variation apart from the role change. Role Taken: Professor X's wheelchair. Variations: Hugo Weaving, wearing a silver jumpsuit inscribed with a large "X", carries Patrick Stewart on his back as he crawls from place to place. During transit, Hugo Weaving is noticed making a soft "whirring" sound. Notably, scenes containing significant movement on the part of Patrick Stewart's character take considerably longer to play out. Variations: During the battle with the Hydra, Hercules cleaves off Hugo Weaving's head. It is quickly replaced with an additional two, however, the second head appears to be Hugo Weaving in Red Skull makeup from his role in Captain America: The First Avenger. As Hercules takes off additional heads, more appear resembling the different personas from different films Hugo Weaving has appeared in. During the final sequence where the Hydra consumes Hercules, Hugo Weaving (now considerably more unwieldy under the weight of several heads) is seen stumbling over to Hercules, attempting to eat him and, being unable to do so, resorting to chewing aggressively on his head. This continues for approximately twenty seconds, after which Hercules stabs Hugo Weaving in the stomach, killing him. Role Taken: A penguin egg. Variations: During a sequence depicting Antarctic penguins laying eggs, one penguin in particular looks to be in considerable distress. The narrator (voice of Morgan Freeman) comments on this, and the camera zooms on the penguin. The penguin rocks back and forth before falling over, and struggles on the ground for a short time. A large group of penguins then gathers around the other penguin, and the narrator comments about the cruel nature of life in the Antarctic. Finally, the penguin screeches, and a fully formed, naked Hugo Weaving erupts from the bottom of the penguin. Hugo Weaving lays in the fetal position on the ice, as the narrator wonders about why this footage was included in the film, citing its graphic nature. The film continues afterwards, although occasionally both Hugo Weaving and the (now deceased) penguin can be seen in the distance. Variations: Ruby Rhod's initial outfit is zebra-striped instead of leopard-spotted. Hugo Weaving's delivery of the character is similar in all other aspects. Role Taken: One of John Wick's handguns. Variations: During the assault on the nightclub that housed Iosef Tarasov, John Wick utilizes Hugo Weaving in a suit as one of his handguns. Notably, the scene lasts a further thirty minutes, due to John Wick requiring multiple stops to rest. Despite this, the action of the film remains the same. Hugo Weaving vocalizes gunshots, throws bullets, and is reloaded by being handed magazines. Variations: During the course of the shoot, Hugo Weaving, naked and golden, descends in and out of the frame in place of the sun. 2. For example, during the screening of "The King's Speech", it was initially thought that Hugo Weaving did not appear in the film, however, it was later observed that he had replaced a minor character in a large crowd shot.